3.) Show us your red, white and blue! So with a little footnote*, here are our Fourth of July decorations. 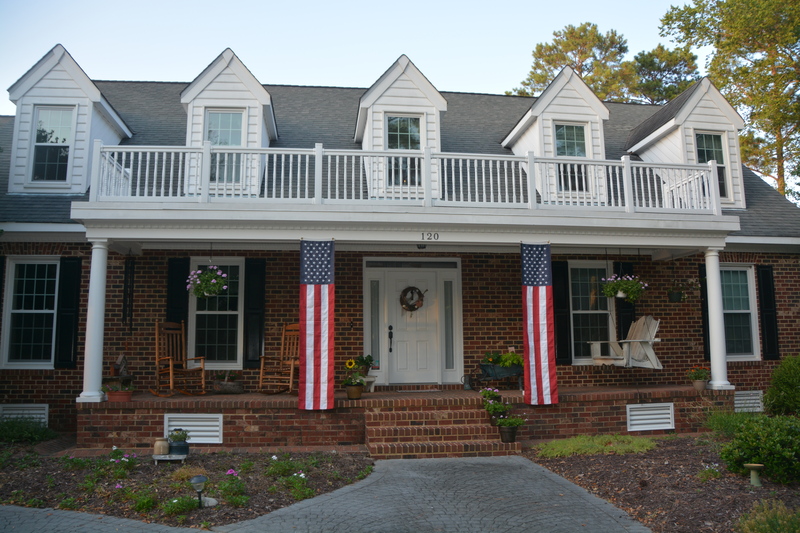 We’ve had these “column flags” for a couple of years, and display them for Memorial Day, July 4, and Labor Day. *You may have heard about a Fourth of July “visitor”, possibly heading in our direction this evening and tomorrow. His name is Arthur. And because of him, I’m holding off on putting up my “column flags” for the Fourth. We could certainly use a little rain, but we’d rather Arthur check any strong winds and subsequent damage at the door. The latest reports say that the Outer Banks, two hours travel time from us, will possibly bear the brunt of the storm. And, once again, I’m pulling out our map of Virginia, for those of you not from ’round here. As you watch the hurricane updates/tracks/guesses, you’ll know just how close it’s coming to our area. So stay tuned. We’re battening down the hatches, and hoping Arthur makes a sharp right turn…soon. 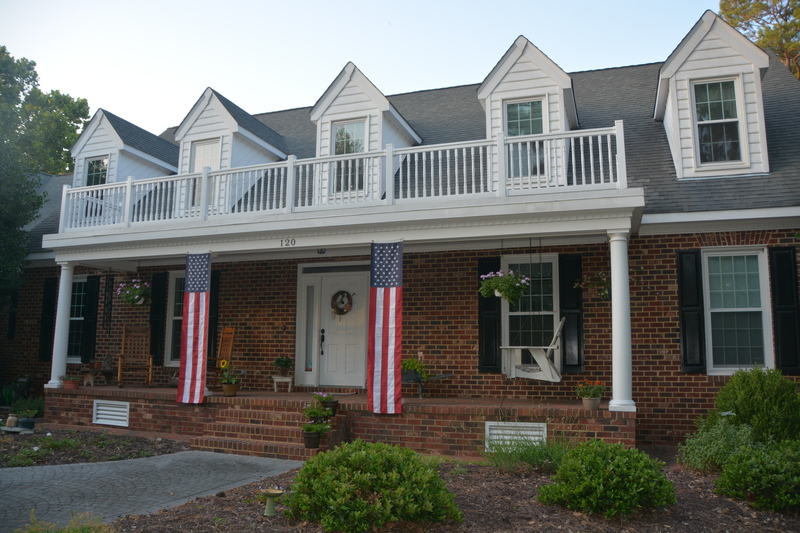 This entry was posted in Days at Home, Family and tagged column flags, hurricane arthur. Bookmark the permalink. Love the column flags……I’m hoping Arthur decides to head out to sea and perhaps give the beaches some beautiful waves but no erosion and no destruction. Also hope you don’t have high water there……here’s to a QUIET day before the 4th!! We’re hoping he feels most unwelcome and decides not to come. …Maybe leaving us a little rain (instead of dust) in his tracks as he leaves. The flags are a wonderful way to honor our patriotic days. Sending positive thoughts your way that Authur won’t cause any damage or problems for you all or for the horses. Arthur sure is giving the weather guessers lots of fun on tv. At last, they have something to talk about for hours. They remind me of political candidates…they love the sound of their own voice!! Hope Arthur packs his bags and heads out, way out, to sea! I can’t believe we are already talking hurricanes and tropical storms!!! Yep – hoping Art heads out to sea …. What a beautiful home you have Dianna! I have never seen column flags, but they just look terrific there. We are watching Arthur for you and hoping he will take a huge turn out into the ocean! What a lovely ideal of the column flags. We are hoping too that Arthur is kind to all of us. Stay safe. Love your home and all them flags. Let’s tell Arthur he’s not invited to the party! I hope to hear soon that your “visitor” cancelled his plans! The column flags are lovely. I’ll keep my fingers crossed that the storm ends up not be very bad. Take care! Those flags are perfect for your house! I would LOVE to have a porch like that! And you make it so beautiful with the addition of the flags! Beautiful photos of your patriotic home! Glad Arthur didn’t storm through too badly.